I walked this, the second stage of the Great Ouse cut-off channel expedition, in May 2013. 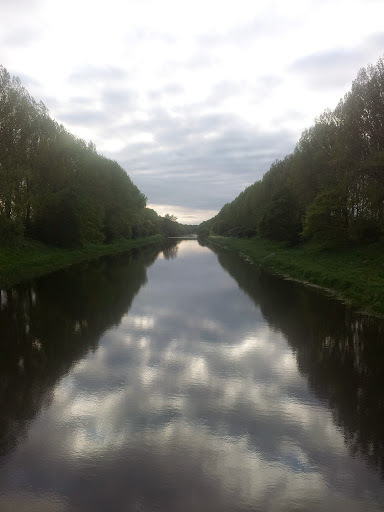 I joined the Great Ouse Cut-Off (or ‘Relief’ as it’s also known) Channel at Downham Market at 6pm one mild Tuesday evening in May. The Cut-Off Channel is a man-made waterway who’s job it is to divert water from the River Great Ouse when levels start to rise. The Channel flows down to Lakenheath, some 20 miles or so to the south before going underground until it reaches Essex, where it empties out into a reservoir. While the Channel cuts through privately-owned farmland, the actual banks (channel-side that is) are maintained and managed by the Environment Agency (EA). The EA is a government body, paid for by me out of my taxes, so as far as I’m concerned I can hike on the land. Is the land actually open for anyone to walk along? Well I had to climb over a fence and scramble through some barbed-wire but there aren’t any signs saying entry is forbidden. The banks of the Cut-Off Channel are a delight to walk along. A gorgeous riot of lush green everywhere you look. Trees line the banks, lovely grassy pathways to stroll along and no litter anywhere. Very little sign of anyone else about at all. Wonderful! I stopped for a while on a farm-bridge and gazed down the channel. So hard to believe there was no one else about in such a beautiful place. Eventually, after 10 miles, I reached the point where the Cut-Off Channel meets the River Wissey. 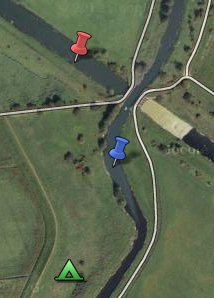 On the photo below, the red pin is the Channel, the blue pin the Wissey and the green icon my wild camp. The Wissey actually crosses the Channel on an aqueduct and I would have liked to given it a proper inspection but the light was fading fast (9pm) and I needed to find a pitch quickly. I couldn’t get as close to the river for the camp as I would have liked. The banks of the Wissey were covered waist-high in stinging nettles and I didn’t have the time to trample down a spot for the night. Instead I found a place on the side of the path. It was almost dark as I set up camp, I pulled out my head torch and discovered the useless thing was broken. Luckily a break in the clouds gave the moon a chance to show herself and I suddenly had enough light to get myself sorted and into my sleeping bag. I ate a Cornish pasty and sipped on a miniature bottle of scotch. The moon was out, the stars twinkled above me, life was good. I awoke at the crack of dawn. 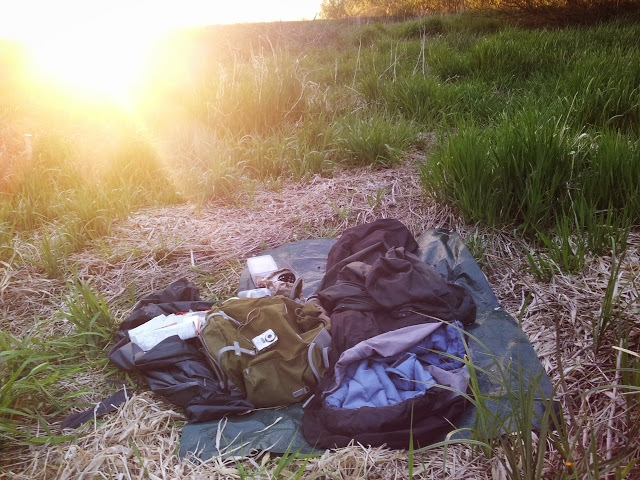 I had slept in relative comfort, my sleeping bag cushioned by trampled grass. I made a cuppa tea, ate some cake and watched the sun come up over the bank. …and soon had my first daylight view of the Wissey. At one point I saw some movement in the reeds by the river and suddenly, before my eyes, I spied three young otters playing together. I watched them, spellbound for a good minute or so before they scurried off into the river. River Wissey – keep an eye out for Tarka! 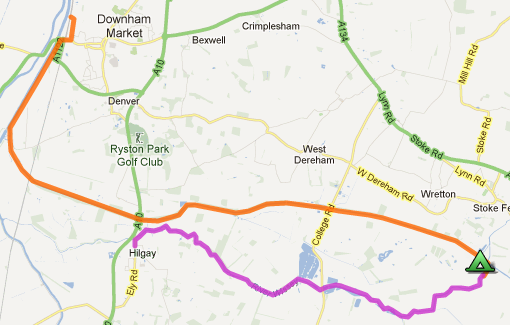 After 7 miles I reached the village of Hilgay where I left the Wissey and took the bus back to Downham Market. I headed straight for the wonderful Railway Arms cafe/bar/pub on Downham Market station where I devoured an egg and bacon sandwich. 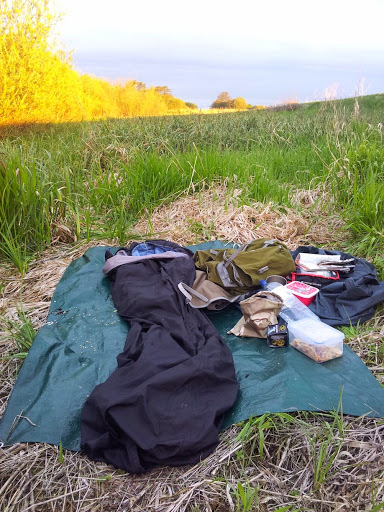 A perfect end to a wonderful wild camp out in the fen wilderness, an adventure close to home in its truest sense. Gorgeous photos! My husband and I walked a version of this walk one day this winter when hoarfrost had transformed each tree & bush & burdock into a fairytale scene (or perhaps glitter-covered coral.) You’ve inspired us to re-visit it now that summer’s here. Thanks for sharing. Lovely, Martin. So quiet and peaceful. Envy you all that wildlife – particularly the otters. Otters! I can spend hours watching otters. Thanks for taking us with you on your wild camping trip. I always look forward to reading your adventures! Some great pictures, both interesting and beautiful. Unless I’ve misunderstood (not at all impossible) the primary job of the Cut-Off Channel is to remove water from the Rivers Lark, Little Ouse and Wissey and thus reduce the amount of water going into the old course of the Great Ouse (the so-called Ely Ouse) by taking the waters north away from those three tributaries of the Ely Ouse. Surely the waters in the Cut-Off Channel are heading _north_ as they pass Lakenheath, not south? Of course there is a secondary scheme, not really linked to flood prevention but rather to drinking water supply, which takes water out of the Cut-Off Channel near Lakenheath/Feltwell, from where the water heads in a tunnel and pipe via Kennet to Kirtling Green where it is transferred into Kirtling Brook on its way to Abberton reservoir. While the amount of water than can be transferred is limited by flows at Denver, I always assumed that was to ensure there was enough water flowing north, not to make sure there wasn’t too much flowing south from Denver to Feltwell. Have I misunderstood? Hi Stephen, thanks for your knowledgeable response. I’m sure you are right, I was taking what I thought was a good guess but now stand corrected. Glad you enjoyed the post! I realise I’m a bit late to this party, but I thought I’d share that the direction of flow changes on the Relief Channel. In the winter, if flow is heavy on the three tributaries, gates are opened at Lark Head Sluice at Barton Mills (River Lark), Hockwold Sluice (River Little Ouse), Wissey Sluice at Stoke Ferry (River Wissey). Thus, the Relief Channel flows north to Denver. The rest of the time, when there’s no excess water to drain from the tributaries, the Relief Channel flows south, with an intercept at Feltwell, Blackdyke Intake, where the water drops 90 feet down a shaft, underground to Kennet Pumping Station, and 280 feet back to the surface at Kirtling Green Outfall into Kirtling Brook, which drains into the River Stour, and then on eventually into Abberton and Hanningfield Reservoirs in Essex. Thank you for the additional information David, much appreciated. This is more beautiful than I had initially thought it would be given the initial description of your walk!! I must say that your photographs indicate a beautiful outing!! Gorgeous!! Excellent post with wonderful pictures like most people above pointed out. I mostly liked the one with the description “River Wissey bank”. Very artistic and kind of reminds of an old antiwar movie, although I can’t remember which one at the moment.